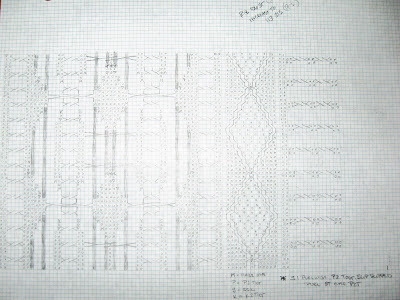 Anyhow, here's another chart for a man's sweater - this one's rather old - I originally did it in garnet heather Bartlett. So, here's a not-very-good-snap of one of my favorite patterns; I think it's handsome, if a bit dull. I did this one in 2004 and came up with the initial rough sketch while attending a meeting on the USA Patriot Act - that's why it's named for it, anyway. I really love the double Aran diamond pattern and tend to overuse it, but here I put in the time to set up the coordinated detailed ribbing and I think it worked out pretty well. I did this in Green Mountain Spinnery's Cotton Comfort in weathered green and it has really worn nicely. Like all my charts, if you're interested in trying them out, they're all pretty much written for light worsted to worsted weight yarn - you could use anything from a wool blend to plain acrylic, I'm not sure 100% cotton would hold it's shape well against the weight of all the cables, but there's no reason not to try it - and I really like charts. But this one lacks full directions - it's just the chart (or about 2/3 of the chart) for the front and back, add whatever neck you like. You'd start with the center 1/3 plus for the sleeves and increase up to about 6/7's of the total width for the top of the sleeve. 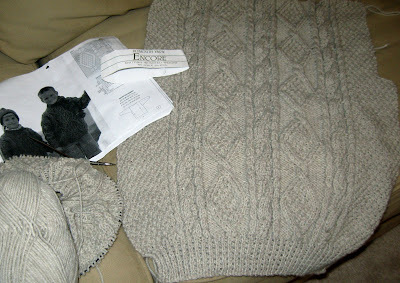 And that ribbing is supposed to be much longer than that, that's just to set the pattern. Anyway, if anyone wants to take a stab, I can write up better directions that that. Dang, thought I'd had this written down somewhere but I can't find it at the moment - this was 2 skeins of Malabrigo plus 8 skeins of Lamb's Pride Worsted - the picot edging was a new thing I was playing with at the time - I got the idea from a lace shawl I started and have since shoved back in the closet - and it really looks great. Anyway, I'll dig out the pattern from wherever I misplaced it and I'll post it. It's easy, fast, fun and an awesome sweater for cooler weather. Happy Thanksgiving, everyone. Hope everyone had a safe and enjoyable holiday and got some time off. We had a very nice, very quiet long weekend. The older I get, the more I learn to listen to my own "outages". When I just stall out on a project, I've learned it's because I'm not where I need to be to work on it, if I try to force it, whatever I do will stink and I'll just end up hating it, ripping it out, or just messing the whole thing up royally. So, the little one's quilt has been malingering on the couch for a while, but I finally figured out what it needed - which is less. So I finished with the satin stitch work I was planning on doing on it, and now it's getting assembled in the dining room. 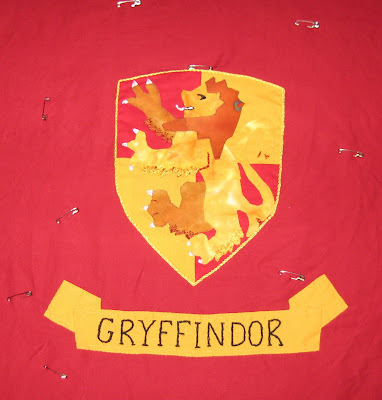 The final plan is to quilt it using images from the headings of the chapters of the H.P. books - kids on brooms, snitches, owls and the like. I'll post some images as I get some of the work done. I have to say at this point that I hate assembly of quilts. I can never get the damn thing flat, or straight and I end up spending hours on it, cursing as quietly as possible. Love the sewing and the quilting, but maybe I can find an outsource for the assembly of the layers . . . . Here it is - one side anyway. It took a couple of tries to get the main cable done, because there are some stitches that are completely added in process - i.e., the panel begins with 49, but increases up to 53 at it's widest point. Steph says she's never done a cable piece before and has started working on swatches. First of all, good for you! I've been knitting since I was 4 and it really, no joke, took me into my 36th year on the planet to learn that "no, it's not different because I'm me, you can't be a free spirit when it comes to gauge, haste makes waste and if you don't like it RIP IT OUT". And I am such a happier person and better knitter for finally getting that through my dumb head. 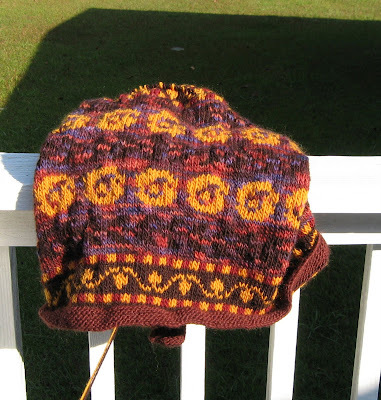 When it comes to working with cables, I love Charted Knitting Designs: A Third Treasury of Knitting Patterns by Barbara Walker. I like visualizing things like this, so I'll get some 10 sq./in. 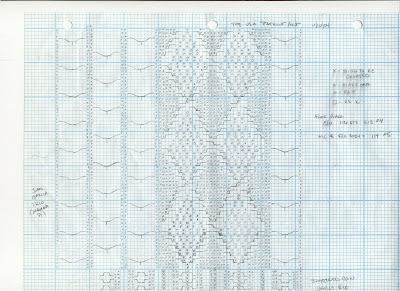 graph paper, pick cables and lay out the front/back/sleeves. Of course, you can buy software that does this nowadays, but I think it helps me to troubleshoot my cables doing it by hand. Though I'm officially cut off until I finish something from starting anything else that's new. That quilt on the couch that's been keeping us company, for instance. Yeah, finishing that bad boy would be a good idea. So anyway, here's my latest redo. More Encore Worsted, this is number 670, blue teal. I want to do the sweater on the left in the picture (yes, it's for a man, but I'll do the medium and make the sleeves shorter and the body longer). It's an old Annabel Fox patterm - the Rowan issue it comes from is from 1988 (actual title is Rowan Knitting Book Number Four: Rowan Rural Traditions, it's listed as OOP in Amazon, but perhaps you could find it somewhere -- this is a very cool issue, some early works by Kaffe Fassett, Erika Knight and Kim Hargraves) written for Rowan Magpie. I made it once a long time ago, but the pattern is not charted - although the sweater on the right side is (which is also quite lovely and I've made that one as well). Anyway, this was before charting things was the standard it's become, so rather than curse a written pattern, I'm going to invest a couple of nights and chart this one out. That center cable is wicked complicated, as I recall. Should be fun. Dang, when I checked this post and opened that snap of the pattern up large, it nearly breaks copyright law. Double dang, once I get the bad boy charted, I'd love to post it, but I'd need to do a ton of research with Rowan in order to do that. Perhaps Annabel Fox has it in another publication, or charted elsewhere? Sheesh, you'd think I'd do more research, being a librarian and all . . . So, you have nieces/nephews you'd like to make Christmas presents for, but don't want to make delicate-wash things that might get shrunk? This is for one of our nephews, and mys sister knits and knows how to take proper care of wool, but I thought maybe (I hoped) synthetics have come a long way since the stretch bell bottom pants I used to wear as a child in the 70's. Come to find out, they have. This is Encore Worsted and it feels pretty nice, not squeeky and yucky like I was worried about, and it knits up evenly and looks like wool and isn't shiny looking either. Makes a very nice fabric, here knit on 7's. I liked it so much I got some of the blue teal to make another Aran sweater. Supposedly for myself, but I tend to get all excited about these things and want to give them away, thinking "Oh, I'll tweak it by doing x,y, z next time and making it in burgundy . . . ."
I make photocopies of all patterns I use so I can take them anywhere with me, write all over them, and now that the young one has discovered astronomy, have diagrams of the solar system all over the back of them. "Ooooh, mom, can I draw on that?" as we ride somewhere to go hiking . . . . It's getting longer . . . Almost up to the armpit now. This is out on the porch. The light is better, more realistic, but it still looks much brighter in these pictures than it does in real life. The second picture does more justice to the lovely gold color. I seem to have quite the romance with yellow and gold going on lately. maybe atlantic, blueberry, twilight and aprico.